I knew I would get a letter from you once you found the green bandana hanging from your locust tree. It didn’t take you long to write either! First, let me say that news of your garden sounds promising, even after the late start and all of the rain. But isn’t it awful how dry everything looks after just a week without rain? I hope you are at least watering your vegetable garden once a week. Anyway, even I don’t know everything there is to know about this garden club because some of its history, especially the history of how it began, has been lost over time. Now there are so many theories and stories about its beginnings that one wonders what is the truth. One theory, and probably the most believable theory, is that one day a gardener got bored with gardening alone and decided that she would seek out other gardeners and form a club. But she didn’t want it to be a club that required members to meet once a month, take minutes, collect dues, and follow any rules. She just wanted the club to be sort of a loose federation of gardeners, a secret society of sorts. As this gardener stood in her garden wondering how this could work, how members could be in a club that never met and still know who each other were, she reached into her pocket and pulled out a green bandana to wipe the glisten off her brow. Inspiration struck at that moment and she decided that members should carry with them a green bandana in such a manner that at least a corner of it was visible somewhere. Then they would recognize each other as members whenever they happened to be out and about where other gardeners might be. That’s why she chose to call the club the Green Bandana Garden Club. Other theories seem less plausible, but are fun to consider, nonetheless. They involve garden fairies and rabbits and rabbit holes, amongst other things. I'll tell you about some of them later. They are really best told late in the day in a garden, just as the fireflies start to come out. Plus, I don’t have the time today to go into all the various theories. I just want to get this letter to you quickly so you will at least have some idea about the Green Bandana Garden Club. More later, I promise, especially on what you are supposed to do now that you are in the club. This is great, Carol, and you are president of yet another group, congratulations! Thank goodness you are surrounded by Hortense and the others for advice, too. They'll never steer you wrong. Dear Madame President, I have a green and blue tie-dye bandana. Will that meet club standards? There just might be a run on green bandanas...or at least a spike in Google searches! 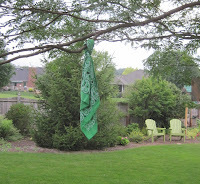 I don't have a green bandana, but I did carry a green washcloth with me to work in the garden this morning. Does that count? What a delightful piece of writing! I am overjoyed to have visited your wonderful blog. Us garden lovers must stick together!